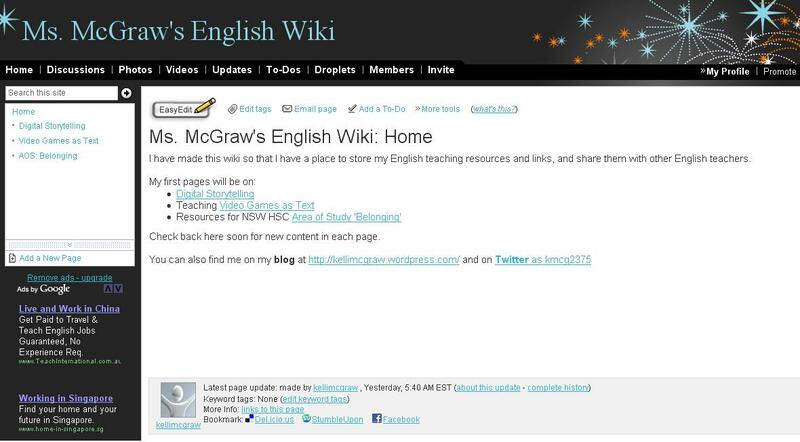 I made Ms. McGraw’s English Wiki so that I would have a place to share my English teaching resources, without using ‘pages’ on my blog. The old pages have been un-published, and a new blog page for Teaching Resources now directs readers over to the wiki. If you have time to take a look, let me know what you think. So far I have transferred my blog resources on using digistories and video games to the wiki, and have added a page for the HSC AOS: Belonging as well. I like reading because its like tv in your head! I think writing stories is very cool too because you can write about ANYTHING in the world, you can use your imagination and write wonderful stories. English helps to get what’s inside of you, out. Any other thoughts/quotation out there people could share on the question of why we read?